Okay, so I'm probably cruising past a glacier or watching whales galivant in the ocean right now, but I sure do hope y'all are doing well! I'm sorry I can't be here to see how you styled your Radiant Orchid looks, but I can't wait to check them out when I return home next week! Thank you to all of you who joined in our first CC link-up last week. Your American Girl looks rocked! 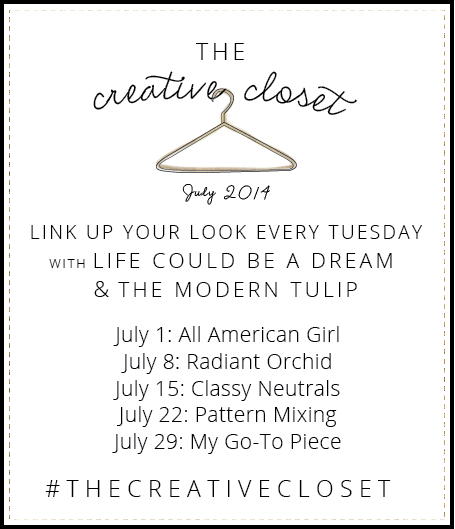 If you are just hearing about The Creative Closet, check out all the details here and join us next Tuesday where we are creating an outfit from the theme, Classy Neutrals. Make sure to share socially with #TheCreativeCloset. And before I forget, if you are interested in co-hosting with Jana and I fill out this form for the prompt that best suits you! Do you have a great prompt idea? Let us know here! If you didn't know, the Pantone color of the year is Radiant Orchid. I seriously couldn't believe this was the only top in my closet that resembled that beautiful color! It's so rich and saturated, I absolutely love it! Now go visit Jana, our lovely co-host Allison and everyone else to see how they styled their Radiant Orchid looks. Xo! 20 comments on "The Creative Closet | Radiant Orchid"
It's a great top! I love short sleeve sweaters because they aren't just for autumn/winter. And that necklace is gorgeous!! Great outfit - could suit so many things! i love that pop of pink against the purple! Your mug is SO cute! And totally loving that shade of purple, so pretty! OK, I'm going to step outside of my comfort zone this summer and join your linkup (you know I'm not a fashion blogger!) but this seems to fun to pass up! Hi sweet beauty (and my fave necklace)! That is the perfect summer sweater and I love orchid. Cute look, lady! 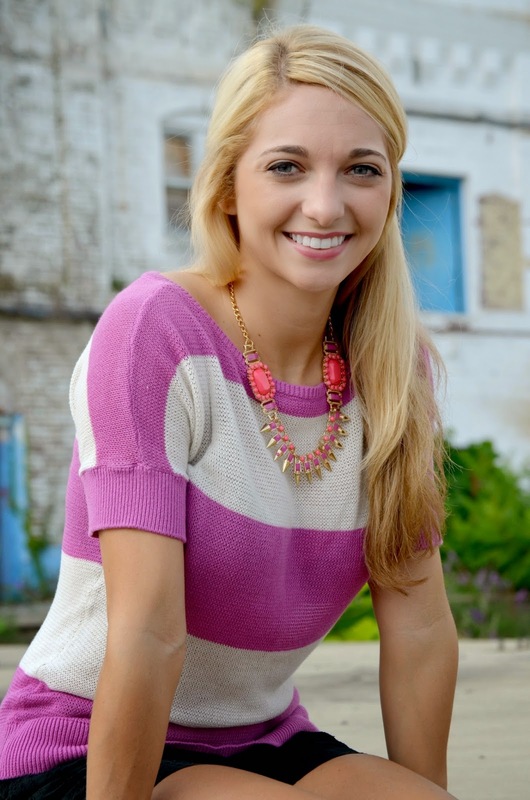 I love the sweater- I'm especially loving summer sweaters this season- who knew these could work even in the South?! And you're a girl after my own heart with that Starbucks mug!! Enjoy Alaska!! Beautiful! I need some radiant orchid...I'm not sure that I have anything that is! :-p Hope you're having fun, Maegan! I have yet to see this colour on anyone where it doesn't look good. It pairs great with so many other colours too! I love this idea, I'll definitely be linking up in the future! Didn't make it for the link up today because of my trip but I'm still loving this link up as a reader! I like that you took a casual approach this week, and I LOVE that necklace! Can't wait to jump back on the wagon next week! Great color... love your stripes! What a gorgeous color! Should make for a great roundup of outfits! 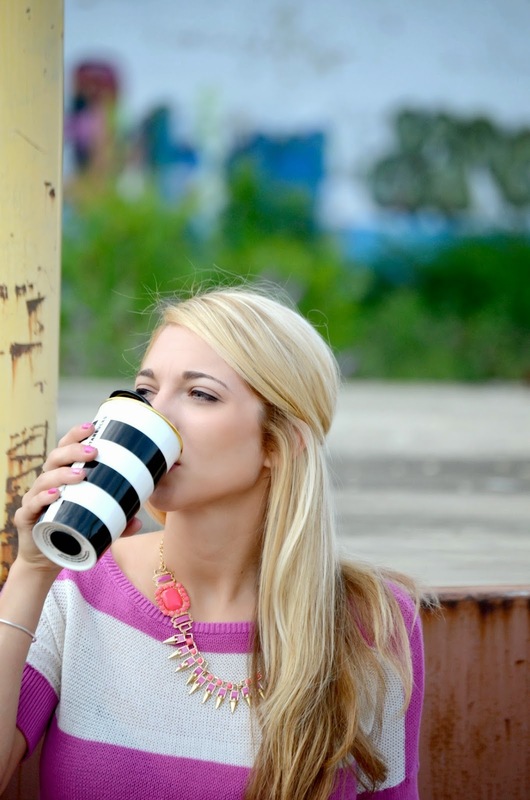 I love the stripes in the top and the coffee cup! So cute. Radiant Orchid is so stunning and I was thrilled to see it was picked for this year. I love the necklace and sweater pairing! 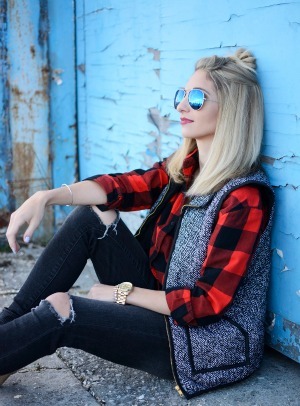 Your outfit looks beautiful and can't wait to link up to the upcoming creative closets! Ahh adorable, as always! I love this idea :) You're the cutest!